All you need to install the washer filter are two standard washer hoses with female fittings at both ends. First, mount it on a wall mount or stand behind a standard washer. 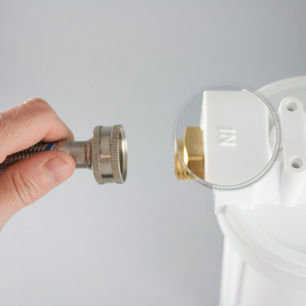 Observing the “In” and “Out” markings on the filter, route the water so that it flows from the faucet, through the filter and into the appropriate (hot or cold) inlet of your washer. Turn the water on and check for leaks.